The LOADMASTER family of Railroad Track Scales includes an extremely rugged and self-contained modular system. This railroad track scale can be installed with various combinations of modules (self-contained scales) measuring 12′ 6″ and 25′ 0″ long. With the proper configuration, virtually any length of rail car (from the shortest to the longest) can be accommodated. 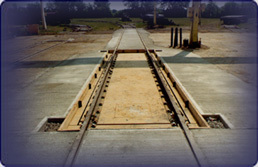 The modular railroad track scales are a self-contained system that ships fully assembled from our factory and ready to install. Our modular scales include a self-contained pit, rugged design, compression load cell, and optional deck. For more information, fill out a request or call us at 800-637-3326. Request a Quote or call us at 800-637-3323.